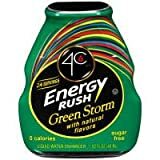 4C Energy Rush Liquid Water Enhancers are flavored drops that can be added to water or any beverage to deliver a boost of flavor and a dose of caffeine. They are similar to MIO Energy Water Enhancers. 4C caffeinated liquid water enhancers come in 3 flavors; Tea, Berry, and Green Storm. There are 24 servings per bottle with total caffeine content of one bottle being 1440mg. So, use with caution and only add the recommended serving. How Does 4C Energy Liquid Water Enhancers Compare? 4C Energy Liquid Water Enhancers contains 7.50 mgs of caffeine per fluid ounce (25.36mg/100 ml).